Abraham has over a decade of work experience in public accounting and industry. Abraham was a Senior Manager at Ernst & Young LLP where his practice focused on advising multinational clients on structuring cross-border acquisitions, divestitures, corporate reorganizations and financing transactions. 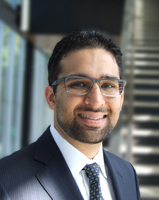 Abraham was also an Executive Director, Taxation at Fairmont Raffles Hotels International Inc.
Abraham Iqbal is an Assistant Professor (Teaching Stream) in the Department of Management at the University of Toronto Mississauga. He primarily teaches taxation courses in the graduate and undergraduate programs. He has tutored Parts I, II and III of the Chartered Professional Accountants of Canada (CPA Canada) In-Depth Tax Course and acted as a seminar leader for the taxation segment of the Institute of Chartered Accountants of Ontario (ICAO) School of Accountancy. Abraham also teaches in the graduate and undergraduate programs at the Rotman School of Management. He was the recipient of the Rotman Excellence in Teaching Award in 2016.